I hope everyone had a wonderful holiday season! I wanted to give a shout-out to a couple of places we stopped last weekend while visiting friends and family in New York. We got to sample a great assortment of gluten-free goodies from Brian Fishman's Sweet Karma Desserts in East Meadow, Long Island, including a fabulous Banana Foster Dome. Tuttoriso in Staten Island has gluten-free everything, from french toast and pancakes for breakfast to meatball sandwiches and panini for lunch and dinner. My first post of the new year introduced the first Goodies Giveaway of the year - a copy of the newly revised Triumph Dining Grocery Guide. You can enter through Sunday, January 10 by adding a comment to the post with your contact information along with the product you most enjoyed trying for the first time in 2009. On Wednesday, I reviewed many of Schar's gluten-free products. The company's pastas and rolls are among the favorites at home. Onto the restaurant news. Pop Pop's Pizza and Pasta in Warminster, Pennsylvania (216 West Street Road, 215-441-8217) now offers Still Riding's gluten-free pizza. As a reminder, Still Riding's referral offer continues through the end of March. If you get your local restaurant to carry the company's pizza, you can get a $100 bonus. Be sure to read the details in my November post. Also on the pizza watch, Seasons Pizza in Cherry Hill, New Jersey (450 Route 70 East, 856-428-4441) opened this week. This is the chain's second location - the other being in Stratford, New Jersey - to offer gluten-free pies. Reader Hellana wrote to say that she ate at the new spot with her family this week and thought the pizza was "fantastic." I'll have more to say about Seasons in a future post. The Philadelphia outpost of Chima Brazilian Steakhouse (1901 J.F.K. Boulevard, 215-525-3233) accommodates gluten-free diets. According to a manager I spoke with at the restaurant, all of the rotisserie meats are gluten free. The only items on the salad bar containing gluten are the tuna pasta salad, Caesar salad, tabouleh and French rolls, according to a list on file at the restaurant. The other salads, fruits and vegetables, cheeses, meats and mousses are listed as safe. There's a lot of anticipation for the opening of Philadelphia's Sweet Freedom Bakery (1424 South Street, 215-545-1899). The owners are planning to open the doors next Friday, January 15. Incidentally, the gluten-free bakery got a shout-out in a recent article about area gluten-free dining posted at Philadelphia magazine's website. Five Guys Burgers and Fries is now open in Cinnaminson, New Jersey (127 G Route 130, 856-829-5200). Asian-influenced Melodia Grill in Souderton, Pennsylvania recently posted a separate gluten-free menu on its website. GF at PHL? Michael Klein of the Philadelphia Inquirer reported this week that Legal Sea Foods is setting up shop at Philadelphia International Airport this spring. The seafood chain, with its other area location in King of Prussia, Pennsylvania, has long offered a gluten-free menu. A check with Legal's guest services confirmed that two of the eatery's locations in Boston's Logan Airport have gluten-free options. I ate there with a friend who is also GF on New Year's Eve, and I can't say enough things about how much I loved it. They offer yucca rolls with Sriracha sauce and they are so much like real rolls! Plus, even though it was a prix fixe menu, they were able to provide every dish GF for us. They use GF soy sauce as a matter of course. Basically, I think they are amazing and would highly recommend your giving them some love on the blog! The one downside is that it's pricey . . . but they are one of the featured restaurants for Restaurant Week, so that might be a great time for any of your readers to try it without paying too much. P.F. Chang's initial Warrior Card loyalty offer for 2010 is 10 percent off the bill for customers when dining in. A number of people have searched this website in recent weeks for information on where they can buy Paskesz gluten-free chow mein noodles. The product is seasonal and will be available in the weeks leading up to Passover in late March. However, readers can buy the wide and fine noodle varieties directly from the company in the meantime. The minimum order is for three bags ($4.79 each) plus shipping; the noodles have an 18-month shelf life. To place an order, call Saralee at 718-832-2400 extension 109. I tried the wide noodles last year and thought they were delicious, with a nice crunch. 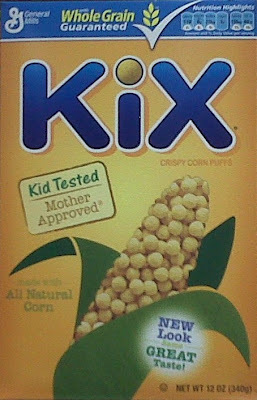 Look for the repackaged boxes of Kix cereal from General Mills, with the labels listing all gluten-free ingredients. The retail versions of Nathan's Famous skinless beef franks are now labeled gluten free, with hydrolyzed corn protein (yum!) replacing wheat protein. Interestingly, the Nathan's cheddar-flavored hot dogs I spotted at a local Acme had the words "gluten free" on the wrapper crossed out with black marker because they still contain wheat. The Delaware Celiac and Gluten Intolerant Group is holding a potluck dinner in Newark on Sunday, January 10 from 5 p.m. to 8 p.m. Attendees should bring a homemade or pre-made gluten-free dish for 4-6 people, the recipe and information on whether the meal meets other dietary needs (i.e., vegetarian, nut-free, kosher). RSVP through this link; the exact address will be e-mailed to those who register. The Whole Foods Market in Wynnewood, Pennsylvania is hosting a gluten-free store tour on Monday, January 11 at 7 p.m. Participants will get to sample items from Whole Foods' own Gluten-Free Bakehouse and other products. To sign up for a tour, call 610-896-8134, e-mail Ruth Harp, or stop by the customer service desk in the store. For readers that aren't close to Acme, Wegmans or ShopRite - three area markets carrying S'Better Farms gluten-free corn dogs, chicken strips and other products - you can now order them directly from Kosher.com. First-time customers can get 20% off their order of $100 or more using code SuperSaver, while using code ShopSave can net returning customers 15% off on orders over $100. Back in September, I wrote about the corn dogs, which are a staple in our house. Please show your support for Gluten Free Philly by making your Amazon.com purchases through this fine website, whether it's gluten-free groceries or anything else (um, does anyone need a Kindle?) Just get to Amazon.com by clicking on any of the product links above or on the Amazon.com banner ad on the Gluten Free Philly home page to start your shopping. I get a small commission from Amazon, and there's no cost to you. I trust this is enough information to make up for my absence over the last couple Fridays! Have a great weekend!